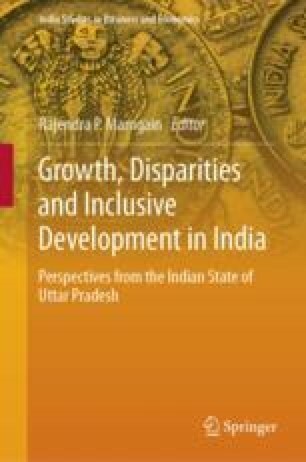 The article examines the performance of the agricultural sector in the state of UP in recent years. The analysis reveals that UP registered high agricultural growth during the 1970s and 1980s in the wake of green revolution, but the agricultural economy of the state registered a severe setback since the early 1990s. The yield growth of all the cereal crops has sharply declined since the beginning of the 1990s. There is also evidence that there has been a significant decline in total productivity growth (TFP) in UP agriculture after 1993–94. Agricultural growth has been marked by sharp variations in growth rates at the regional and the district level. Analysis of major determinants of agricultural growth revealed that the growth rate of irrigated area and fertilizer consumption, which were the main sources of agricultural growth during the 1979s and the 1980s, has significantly slowed down after 1990–91. The role of price incentive in agricultural development has been nominal in Uttar Pradesh. The paper highlights the major constraints on agricultural development in the state like the small and declining size of holding, poor rural infrastructure, unsatisfactory condition of the public support systems to agriculture in terms of input supply, credit and marketing and lack of a suitable policy environment in the state for agricultural growth. The paper suggests an integrated strategy for agricultural development is required for accelerating agricultural growth in the state with a particular focus on small farmers and lagging districts. Source Calculated from data in Statistical Abstract U.P. Appendix 7: Public Sector Investment in Agriculture in U.P.